Settlers of Catan plays in about 40 minutes or so. It is a game about resource collection, trading and management. The game starts with you creating the island- placing hexagonal cardboard tiles next to each other creating a map of sorts- then assigning a number to each hex. This is where the game’s varieties lie. You can create a multitude of islands that can deliver gameplay in different ways- some islands stress some resources over others, some have a relatively even amount of resources, or, if you want, you can create an island riddled with sheep (there is an app called Catanerator which randomly generates maps which, if you play a lot, is super handy). However, this is also the weakest link of the boardgame. The cardboard tiles can be amazingly awkward to set up. You end up fumbling with the last few pieces for a few minutes while every person in the room is looking at you. But once that is done, the boardgames starts. The gameplay of Catan is elegantly slick. There is a fantastic balance between luck and strategy. You place towns and cities between the hexes, and roll two dice. If the number on the dice is the same number on a hex that your town is next to, you get sweet resources. This is where a lot of the strategy of the game comes in- if you have a town next to numbers that get rolled more frequently (like a 6 or an 8), you’ll be pulling more and more resources from that hex than the poor bugger that put his town next to a 2. If you set the game up right, it’ll be fairly even between the players so there’s no need to worry about a player snagging a super spot and dominating the game. Even if a player gets ahead and starts swimming in resources, there is the robber. Every time the a 7 is rolled (statistically the most likely), everyone with a lot of resources has to give away a painful half of these resources back to the bank. Then, to add to the pain, the person who rolled the robber, can then block resources of a single hex until the robber is rolled again. Dominating the clay market by controlling an important hex? Chances are it will be blocked by the robber pretty soon. It has a natural rubber banding effect- the people with a tonne of victory points and resources are targeted more often than the poorer players, allowing them to catch up (in theory). As such Catan feels like one of the most balanced games I have ever played. I have played games where, despite my luck being virtually non-existant, with some crafty trading with other players, I have been able to come up on top. On every turn, all the players are engaged with the dice rolls, trading, and praying that you get just one more wood, so that you can build a road that cuts off another players, thus allowing you to get the longest road but every other player knows that, so no-one is trading with you etc. etc. 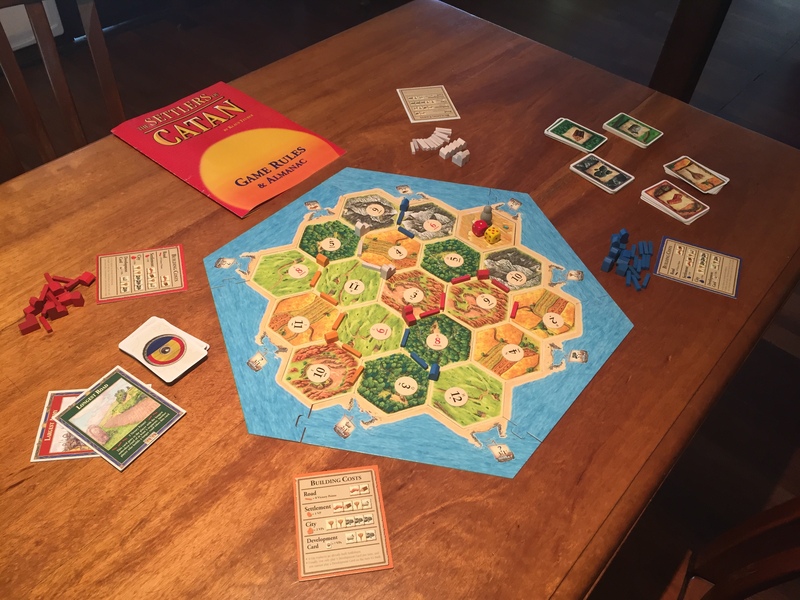 I could go on and on about Catan’s deeper mechanics- the port trading system, the development cards, the relative importance of different material but I will leave this for you to discover and think about it when you open the box. Catan is a must-have game. It is a 40-minute bite into the what the world of board gaming can be, and is a fantastic gate-way game to introduce your friends to the hobby. It is simple, yet deep, and incredibly engaging. Catan currently goes for around $60-70 AUD, and has solid replayability value. It is available online, and should be in both independent and franchise stores around the country. It caters for 2-4 players, but plays best with 4 people. You can extend this to six with an expansion.If you are looking for Catan in another language, you might have to search online. Catan also has a tonne of expansions- some which adds gimmicks into the game, some expand their strategy. It can add bandits and knights, new islands and sea-exploration. Eventually we’ll look into these expansions and hopefully give a comprehensive guide on what is good, and what isn’t.